Home Styles Create-a-cart in a cottage oak finish with a 3/4 inch Cherry finished wood top features solid wood construction, four cabinet doors that open to storage with three adjustable shelves inside, handy spice rack with towel bar, paper towel holder, and heavy duty locking rubber casters for easy mobility and safety. Size: 48.75w 17.75d 34.75h. Assembly required. Home Styles Cuisine Kitchen Cart in a cottage oak finish with a black granite top features solid wood construction, and Utility drawer; 2 cabinet doors open to storage with adjustable shelf inside; Handy spice rack, Towel bar; Heavy duty locking rubber casters for easy mobility & safety. Size: 32.5w 18.75d 35.5h. Home Styles Create-a-cart in a cottage oak finish with a stainless steel top features solid wood construction, and 4-Utility drawers; 2 cabinet doors open to storage w/adjustable shelf inside; Handy spice rack with Towel bar; Paper Towel holder; Heavy duty locking rubber casters for easy mobility & safety. Size: 48w 17.75d 35.5h. Create-a-Cart Warm Oak Finish with Cherry Top Home Styles Create-a-cart in a cottage oak finish with a 3/4 inch Cherry finished wood top features solid wood construction, four cabinet doors that open to storage with three adjustable shelves inside, handy spice rack with towel bar, paper towel holder, and heavy duty locking rubber casters for easy mobility and safety. Size: 48.75w 17.75d 34.75h. Assembly required. 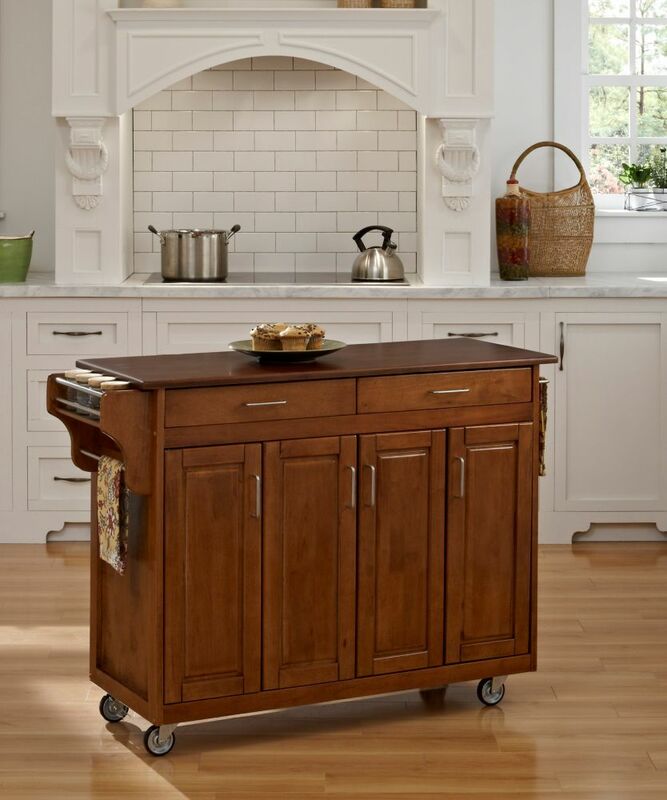 Create-a-Cart Warm Oak Finish with Cherry Top is rated 4.7 out of 5 by 3. Rated 4 out of 5 by TL from Looks great in the kitchen.The only problem was the drawers... Looks great in the kitchen.The only problem was the drawers did not line up. Had to adjust the slides slightly. Added feet in place of casters.